Judge Joseph Claps got in hot water in July when he dropped what was believed at the time to be a small handgun while walking through the lobby of the Leighton Criminal Courthouse. Charged with carrying a concealed weapon in a prohibited area, a Class B misdemeanor, he was reassigned to non-judicial duties pending a hearing. 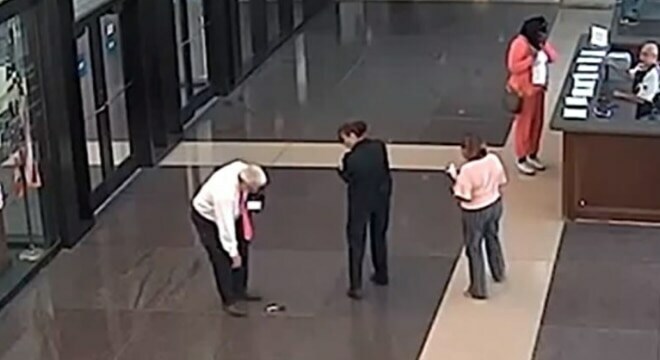 However, Will County Judge Edward Burmila this week said no one could be sure the “gun” observed on security footage and by those in the lobby was real. Pointing out that two nearby sheriff’s deputies continued walking after Claps dropped the small silver-colored item and never recovered a gun — although they reported they saw one to their supervisors — was proof enough that it wasn’t there, Burmilla found Claps not guilty. “I can’t believe they would simply walk away from a firearm laying on the floor in the courthouse,” said Burmila. Another observer, a security guard who was about a foot away when Claps dropped the item, testified that she thought it was a real firearm but that she didn’t move to secure it as she believed the judge was exempt from the courthouse’s posted gun-free zone which allows exceptions only for law enforcement. While Claps has a state firearms card and concealed carry permit, he was not exempt from the ban. “This was an exceptionally unique and unprecedented situation and our deputies that witnessed the gun fall from Judge Claps’ coat immediately reported the matter to their supervisors,” a policy director for Cook County Sheriff Tom Dart told the Chicago Sun-Times. Claps is still pending review by the state Judicial Inquiry Board, who could choose to sanction the 70-year-old judge over the matter.